We’re now into the final week of animation before the submission of the Honours portfolio on Monday. I met with Lynn this week to show my progress and feedback was positive. My animation still goes too fast in some places but slowing down and adding additional character actions has benefited the story and added more depth to the character. I still have the weekend ahead of me to film the rest but I have made some progress since the last update blog. While I’ve spent the last few days focusing on my dissertation and additional work for the graduate show, I’ve animated the character begin to form their body. I’ve been using Stop Motion Pro 7.5 Studio HD to capture frames for the project so far. I’ve had the software for a couple of years and it has a number of useful features such as onion skinning and frame blending (taking multiple pictures at once for one frame) to reduce visual noise. One thing I’ve never managed to use well is its editor. Its difficult to add frames and move them around and if you save a clip as an AVI, its a nuisance to go back and edit once its saved out and laid in an editor. 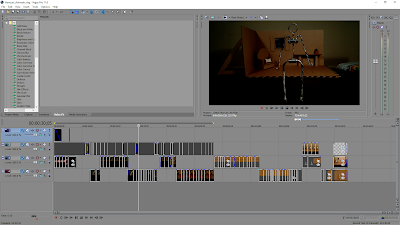 For those reasons I use Sony Vegas Pro 11.0 to lay out all the frames where I can extend, add and remove them to my liking. I’ve set Sony Vegas to automatically set images to 0.07 seconds long which is 1 frame at 15fps (frames per second). However I also have the project settings set to 30fps so that allows me to not be constrained to 15ps, I can double frames up to work on twos or extend a frame by a half. I prefer this level of flexibility so that I am able to fine tune timings if necessary. Its important that I don’t mess around with frame rates too often as this can be jarring or look out of place. Similar to how I approached my Lego Batman v Superman Trailer video, I’ve laid out my animatic underneath so that I can compare my captured animation to the animatic at any time. It also benefits me for scheduling and working out the pace in which I can film shots by having a visual representation of what I have left to do. Both in the Lego Batman v Superman video and this project, I’ve managed to become very good at scheduling my time when it comes to animation. My time management everywhere else is still mixed. I’ve began to source sound effects and will record my own voice to add to the character. The animation will still be unspoken but reaction noises will help to give the character a bit of life. The sounds I’ll be adding will be comical in nature to match the tone of the animation and provide an additional layer of interest to the animation. I haven’t yet decided on a musical track. I will add one if I come across the right track but won’t force one in if I’m not happy with it. If I were to add music it’d be upbeat and not too strong. Something classical or calm would allow the visual storytelling to be the main focus.